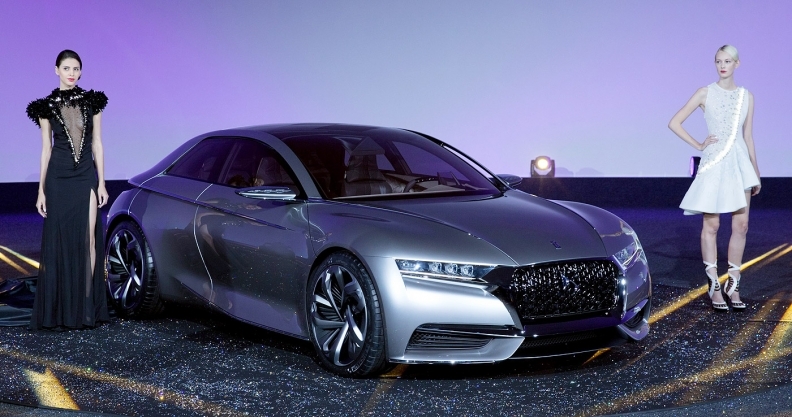 The Divine DS concept has a prominent grille flanked by LED headlights that show DS's future styling. RENNES, France – Citroen’s DS brand is hinting at its future styling with the Divine concept car that will debut at next month's Paris auto show. The fresh look will increase the differentiation between DS cars and mainstream Citroen models. PSA/Peugeot-Citroen upgraded DS to a stand-alone brand from a subbrand of Citroen on June 1. The concept shows how DS will be "an alliance between sophistication and technology,” DS CEO Yves Bonnefont said in a statement. Introduced four years ago to boost PSA's profit margins and prevent customers from switching to premium brands that are encroaching on volume segments, DS has expanded to offer three subcompact and compact cars. Bonnefont said the DS lineup will expand to six vehicles in the medium term. The DS brand is already making a positive contribution to PSA's automotive earnings, Bonnefont told reporters at an event earlier this month at the group's research center near Paris. The five-door Divine compact hatchback is powered by a turbocharged 270-hp, 1.6-liter gasoline engine. Ian Fletcher, an analyst for IHS Automotive, said DS can offer an alternative to equivalent Audi, BMW or Mercedes-Benz models. "The concept's styling has a look of quality about it and the grille immediately gives an impression that you would expect from a premium vehicle."